For the first time ever on a headlining tour, Adam McIlwee, the Pennsylvania electronic angst auteur who records as Wicca Phase Springs Eternal, has gone out with a stage backdrop, and it’s impressive. But last week in Brooklyn, he didn’t use it. No need, really, as the artist was performing in front of one of the most dramatic views a New York venue has to offer: the elevated tracks of the J, M and Z trains, which rumble by periodically mid-set, just outside the beloved indie venue Market Hotel. It feels like a moment for Wicca Phase. Maybe not a splashy, look-at-me moment, but then, flexing is not really for McIlwee, who at 29 has already logged several notable chapters in an unlikely musical path, one that’s bridged punk, hip-hop, emo, and most recently evolved into singer-songwriter acoustics. He’s still based in his native Scranton, PA, where in the late 2000’s he fronted the indie outfit Tiger’s Jaw, until more electronic and experimental tendencies led him to split from the band in 2013, to devote himself fully to Wicca Phase Springs Eternal. It was a solo project with a work-in-progress identity, but one with beats, synths and general gloom at its core. McIlwee has played with sounds and themes over numerous EP’s and singles: outsider visual art, comics, the occult and conspiracy theories have at times inflected his songs, as have fraught relationships. But he’s never confronted domestic drama quite as head-on as he does on Suffer On, his second full-length, released last month and a record that marks something of a reset in the way McIlwee approaches creating music. Signature Wicca Phase issues of connection and anxiety once again pepper Suffer On, but their musical backdrop has been tweaked. His familiar trap rhythms are still prominent—McIlwee worked again with frequent beatmaking collaborator DØVES—and a handful of tracks are fully synth-based, including the record’s infectious breakout single “Just One Thing”. But a remarkable amount of Suffer On puts acoustic guitar front and center. Previous Wicca Phase releases have dabbled in it, but never to this extent—one song, “Crushed”, is little more than guitar and McIlwee’s increasingly confident voice. It’s a refreshing new look for McIlwee, casting him for the first time as a millennial iteration of the sort of singer-songwriters he’s long admired—Leonard Cohen, Nick Cave and Phil Elverum—and moving him further away from “emo rap” – a tag he’s been eager to shake, and one that which comes in large part from his best-known affiliation. Wicca Phase, along with the like-minded outsider musician Cold Hart, co-founded GothBoiClique, the celebrated collective made up of nine genre-bending boys, punk-bred magpies in various musical styles but who more than anything became synonymous with the melding of revivalist emo and trap – a formula that has in recent years transcended the underground to become a signature sound of late 2010’s hip-hop. The LA-based GBC existed for several years in a very passionate corner of the musical fringe, until being thrust into much greater notoriety in 2016 with the inclusion of a charismatic newcomer who went by the name Lil Peep. Gus Åhr’s time with GBC was short—a little more than a year after joining the group, the “Crybaby” supernova was gone, far too soon. With Peep’s November 2017 passing, the C-suite label honchos came calling, eager to catch whatever residual clout they could by signing GBC’s various members. 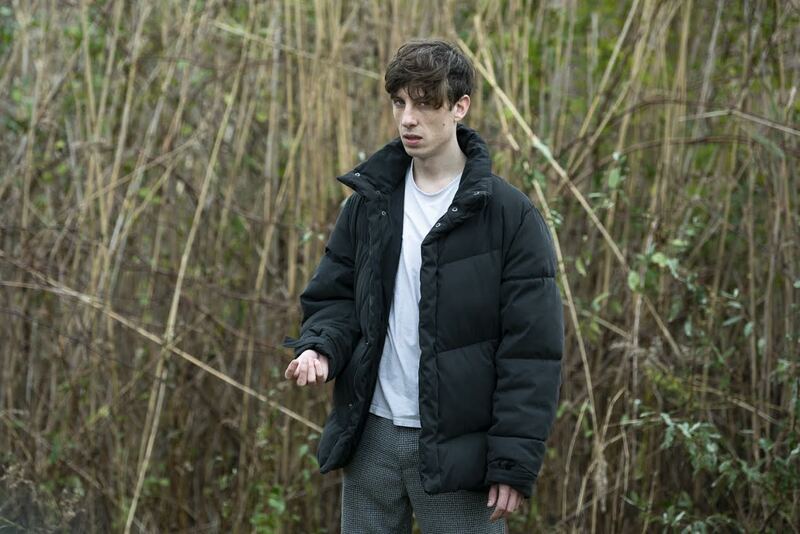 None of them received more suit-wooing than Wicca Phase, but in the end, McIlwee went with Run For Cover, the indie stalwarts with whom he’d had a long relationship. McIlwee himself calls Suffer On a “depressing” album, and while it’s no emotional walk in the park, depression is relative, and it’s nowhere near the level of druggy misery of, say, part two of his late friend Peep’s Come Over When You’re Sober. Those guitars point to a new, uncharted, and hopefully prosperous future for Wicca Phase Springs Eternal, and his Market Hotel show was anything but a downer. A few hours before he took the stage, I sat down with a good-spirited McIlwee at a nearby Bushwick bar. So, Adam! The tour began last night in Philly. How was that? I know you had tweeted about having a ton of anxiety before it. Adam McIlwee: [laughs] Yeah! I get anxious normally, especially before tours. I mean I am a naturally anxious person, but Philly is kind of like a hometown show, and the guest list was, we had like 80 people on the guest list. Capacity was like over 100 per cent. So it was a little crazy, but it ended up being good. It was a cool show. Is most of the new album Suffer On in the set at the moment? McIlwee: Yeah, we’re doing seven. Seven out of ten? You play a lot of acoustic guitar on the record. Are you doing it in the show as well? McIlwee: No I don’t play any guitar in the show. I did play all of the guitar on the record, but with this being my first longer headlining tour I was already nervous enough, and I didn’t want to throw in the added element of live guitar, yet. I figured I would just play the regular tracks. I mean I have live mixes of them, so if there’s harmonies or something, they’re still in there, but the vocals are taken out. I was just a little bit too nervous to start with the guitar, on this tour. I have some stuff in the summer, like one-off shows where I might try it. You’ve had guitar here and there on past Wicca Phase releases, but never like this. How did that come about? McIlwee: With this album coming out on a proper label, I knew that I would want to handle most of the production myself. The way my other stuff worked was I would just get beats from people, be it one producer sending me a bunch of beats and I would just use all of those for a project, or multiple producers sending me beats, and I would record over 20 songs or something and try and pick the ones that fit most cohesively. When you do that, it’s the producer dictating where the song goes. I think that there’s some sort of internal thing that happens when you hear a beat for the first time, where you think, “this song is already half way there.” It’s already half way to completion, right? And I have to work my part over it. So I knew doing this album that I would want to write it from scratch. I would want it to be all me, in the sense that I would pick the kinds of songs that were on the record. So when I started writing it, I was doing it on guitar just for rough ideas, and the more I was writing, the more I realized that the guitar parts were becoming integral to the song, and the way I was writing vocals around certain guitar parts. And so I realized, I have to put this guitar part on there. I can’t substitute it with synthesizers or something. Now, there are some songs that are just keyboard, pads, 808 bass and drum patterns…. “Just One Thing”, for instance, doesn’t have guitar. McIlwee: Exactly. And that’s pretty much just a bass synth, a very aggressive drum beat and a little bit of pad just to give it some space-iness. But yeah it just seemed like guitar was integral. It’s what I play the most, and so it ended up being where like eight of the songs have heavy guitar on them. Songs like “Crush” and “Contact” really cast you in an acoustic singer-songwriter light that’s pretty new, considering most people think “emo trap” or something when then think of Wicca Phase. Do you think that this record kind of evolves the perception of who you are and what you do? McIlwee: I hope so. That was the intent, too. Because some of my favorite types of artists are singer-songwriter types. When I was in middle school, like 12 years old, Bright Eyes was like it for me. Pretty much everyone on Saddle Creek Records. I was never into like emo, in the traditional sense. I was into more the indie side of just, depressing songwriters. And from there, my favorite artists have always been singer-songwriters. And that’s a lot to do with my family, my uncles are really into Leonard Cohen, and so growing up I was listening to that a lot. Bob Dylan was always a major influence for me, Nick Cave, of course. He’s probably number one for me. But even newer, like Bonnie “Prince” Billy, Phil Elverum [Mount Eerie], they’re my favorites. And I understand that what I’m doing isn’t exactly in their vein, but I thought that if I want to re-direct, because—I know this “emo rap” craze isn’t gonna last forever, right? And it’s not like I ever intended to make that kind of music, it’s kind of just what happened naturally. But I thought, this is kind of my chance to show people what I really have for the first time. Because this is the first time I’m getting a major PR push, a label backing me and supporting me—I can pivot a little bit, and take things in the direction that I want to go in the future, over the next five to ten years. And I thought having songs with guitar would help me do that. You ended up releasing this on Run For Cover, who you have a long relationship with, but you had some big labels sniffing around? McIlwee: Yeah well, when I first started Wicca Phase and I was in Tiger’s Jaw, I was doing blogging on Run For Cover’s website, as Wicca Phase, and they’ve always been really supportive. And around 2017 we started talking about what me being on Run For Cover would look like, and I was weighing it. But after Peep died—very shortly after Peep died, I started getting offers, major label offers. Very quick. And sometimes it wasn’t even from labels themselves, but just like industry executives, who took note of Peep, who maybe weren’t fully aware of Peep was before he passed, but then the public response to his passing was so overwhelming—it kind of forced people to notice. And I think that’s pretty typical. When someone dies and you might not know who they are but everyone else is talking about them, and your ears kind of perk up and wonder, “Well, how did I miss this?” And I think that’s what a lot of people were doing. So, naturally, they came to me and to others in GothBoiClique. There were offers being floated my way, but I just felt uncomfortable with the idea that someone would be so quick to give me so much money when a few months before they might not have known who I was. And it’s a largely untested genre—or at least it was at that point. This was before Juice WRLD, just as Post Malone was beginning to—right when “rockstar” was first hitting—so kind of untested. And to be honest, I understand that advances from a record label are essentially a loan, and that money has to be made back. And in many cases the money that you’re given is all the money that you’re gonna see unless you’re confident that you can make that money back. I am not confident that I can make a major label a million dollars back. I’m not! But I know that I can make an independent record label a few dozen thousand dollars back. I can do that, and once that money is paid back, then I start getting my own checks—I know I can do that. Were the Suffer On songs all written fairly recently, or are some of them things you’d had around for a while? McIlwee: Not that long. I started writing it at the end of 2017. I wrote three songs. I wrote “Rest”, “Contact” and one other one, I forget which one it was. And then I sat on those three for a few months. I would say it was about six months, where I recorded those three, played a bunch of shows, and then set studio time, like I had studio time booked for June to properly record everything. So I had until June to finish writing the songs, and I would say I wrote the other seven or eight songs within like a two-month period. And you and DØVES worked on the tracks together? McIlwee: It was me recording the guitar parts to a click track, and sending like a very rough of a beat, to give him like the tempo and stuff like that—or, just sending the guitars and you know, set to a click track, and a vocal. Track by track? Would you do as much as you could on one track and then send it to him? Vocals were pretty much done, demoed at least. Send then to him—most of the time there was no beat behind the song, just guitar and a click track. He would make the beat, and then go to the studio. But me and DØVES had everything finalized before I went to Studio 4. I know you’ve drawn on relationships before, but Suffer On seems really relationship-specific. McIlwee: Yeah definitely. [2018 EP] Corinthiax kind of was a concept record, in the sense that I wanted to write songs about the occult, demons, stuff like that. And that would be the over-arching, I guess “theme” of it, along with relationship stuff woven in. And this is vice versa, I think. I think here you have the relationship at the forefront, and a few occult-y, witch-y aspects, just as metaphors throughout the album—one line here or there. And that’s probably because I knew that I had to put all that I had into this album. I didn’t want it to seem disingenuous or anything like that, and it was for whatever reason an emotionally heavy time for me. And I think that is a result of the writing process. I was writing these songs pretty much at my grandmother’s house. I normally write and record at home, but they were doing work on my house. So I was going up the street to my grandmother’s house, and I was just in her basement working. It’s just like a work space, there’s no internet and there’s no phone service. And I think what happened was, I was in my head largely, right? And the more depressing aspects of my life and my relationships—once I wrote the first song, I think they just started compounding, and I think that what was going on was—I couldn’t pull from anything else because I didn’t have the internet to distract myself. So I was just in that head space, and it just kept going, and the more I thought about it, the more depressing the lyrics got. To be fair, musically it’s not that depressing, including “Just One Thing” which has this great chorus and may be one of the most immediate songs you’ve ever put out. Did you kind of know it would be special for you when you created it? McIlwee: Yeah, when I was writing it, I was thinking that this is the exact type of song that I want to write, in the sense that it’s musically fast, and I come from a punk background, that was always my thing. Locally there was a strong punk scene, my local heroes were all punk kids who were like a year older than me, and that’s where my love of fast music comes from, and that’s why I love a lot of trap music, because it’s fast and a lot of progressions are just two chords, right? They’re punk songs, in a sense. So musically, it’s exactly what I want. It’s the type of music that I like and I wish more people would make. So it has that going for it. It’s one of the first songs I wrote that has a very obvious chorus to it. And when I wrote the first version of “Just One Thing”, the hook wasn’t as catchy, and it kind of rambled a little bit. It was kind of convoluted. But when I was recording it with Will Yip at Studio 4, Will suggested that I cut that rambling part, and just keep the immediate, catchy part, and just repeat it. And it worked! Once I heard it recorded I understood that if one of my songs was to resonate with people who don’t like my music, this would be the one. If one of my songs had to be on the radio, for whatever reason, that would be the one. The other one that stood out for me as different is “Put Me In Graves”, which is so upbeat. McIlwee: Yeah well that’s a punk song. It’s a punk song with 808’s. I had never heard a song like that, so I wanted to try it. Other people in GothBoiClique were doing more punk and post-punk type stuff—Yawns especially. I don’t know how familiar you are with him, but he really stepped up his production game. When he first joined GothBoiClique, he was doing some production on his own, but mostly he was doing graphic design and stuff. Then he moved to New York and just went for it in terms of production, buying studio time and recording actual drum tracks, taking them back to his apartment and making songs and stuff. And I started to hear the stuff that he was doing, and I was like, “Okay this is what GothBoiClique could be. It doesn’t have to be this emo-rap thing, which all of us are bored of anyway, because everyone is doing it. Now any kid can go on YouTube and type in “Lil Peep type beat” and get a beat that sounds like one of ours, right? And sometimes it might be better than ours, because there’s been time for people to perfect that type of stuff. They can buy a microphone for 50 dollars, record the song and upload it to Soundcloud all in the same day. Right? It’s easy to make this kind of music, and we all want to do something different, we all want to take the next step. Yawns and Fish Narc both started doing that—they just understood that there needed to be an evolution. I don’t know if there’s ever been an artist—from Jimmy Eat World to Conor Oberst to Gerard Way—that’s loved being called “emo”, though I think eventually most of them got to be kind of “whatever” about it. But you really are not a fan of it, are you? You mean, is Leonard Cohen emo? McIlwee: You know what I’m saying? A few months ago, I talked to Dylan, Smokeasac [Peep’s producer] about the intensity of a lot of the fans in your corner of the music world, and how so many of them connect with lyrics about anxiety and depression. And he’s super willing to try and help people dealing with that to the extent that he can. Do you get that a lot? I think I would be intimidated about being put in the position of like, a counselor to fans. McIlwee: Yeah [laughs] yeah, I do. I mean if you go to my Instagram messages, they’re crazy. In the sense that, people think that because I’m singing about things like different instabilities or insecurities, that I’m an expert in them or that I’ve found some sort of solution for them. They think, “Oh, this guy is an artist. Of course he’s figured this out by now. I’ll ask him!” and it’s like, “No! I wouldn’t still be singing about this stuff if I had any sort of answer.” I was interviewed recently, where someone asked me about the title Suffer On, and what I’m trying to say with that. And I basically told them that I have no answers for any of the issues that I’m talking about, or any of the depression that’s in my music. I don’t have anything! It’s still going on, it’s here for you to examine and listen to and take it, but you’re not gonna find any answers in that record. So both Dylan and Makonnen, who I spoke with only a couple of weeks ago, have spoken about the beefing and in-fighting that existed around Gus [Peep], both before and after his death. And I know some of those hard feelings involved members of GothBoiClique. McIlwee: It was during the second tour, the tour he passed on, that things got dicey, where Peep and Tracy were totally not talking. Or if they were, it was confrontational. More so probably Tracy tweeting stuff or whatever, mad about kind of being the Robin to Peep’s Batman, which is stuff that we could have worked out, but it’s fine. There was never any issues with Smokeasac, there was never any issues with Makonnen, we knew Peep was working with Makonnen in London and stuff. Because prior to that tour, Peep was living in London for a few months. But you hated to see it between Tracy and, and I know how terrible Tracy feels about that now, because who knew how that would have ended? I mean, they were close and they had a falling out, but I don’t think either of them ever intended that to be a permanent falling out. Because Gus wasn’t really about any sort of public fighting, or anything like that. He just wanted to live his life. He couldn’t really be bothered with that. It was the people around him that liked to pick fights, and sometimes that was people that were in GothBoiClique, sometimes it was people who weren’t in GothBoiClique. Insecurities can be crazy, especially when you’re in such close proximity to someone whose stock is rising so quickly. There’s a GothBoiClique tour on the way, and possibly a second group album? McIlwee: We have a bunch of songs. We finally managed to get organized, in the sense that we’re touring this summer, doing a Europe tour, for about two weeks or something, end of May, cause we’re playing Primavera. McIlwee: Probably six or seven of us. And we’re gonna release this album, but we have to finish it. Right now we have four recorded, they’re all collabs. I think that on two of those it’s me, Tracy, Macned, Cold Hart, Horse Head. So, five people on those songs. On another one, it’s me, Horse Head and DØVES, and there’s one that’s me, Cold Hart and DØVES. So like the first album was Yeah It’s True, this one will be Yeah It’s True 2—I think!